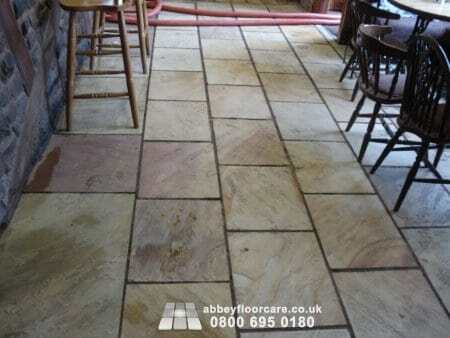 This Sandstone cleaning Leek project arose after a restaurant in Leek, Staffordshire was searching online for advice about cleaning a sandstone floor in their bar area. 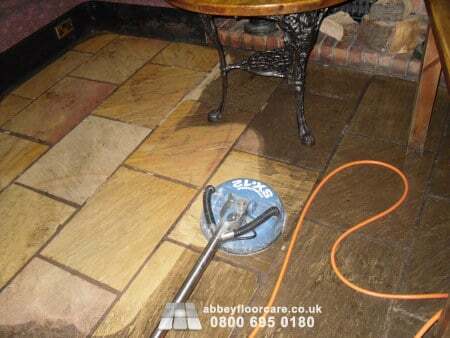 They came across our Sandstone restoration service and asked for help with cleaning the Sandstone tile floor. They had cleaned the floor many times using a large steam cleaner. However, the results were less than satisfactory as there was a lot of residual ingrained soil. They had tried vacuuming off the dirty slurry, but they could not get all the dirt off the floor. 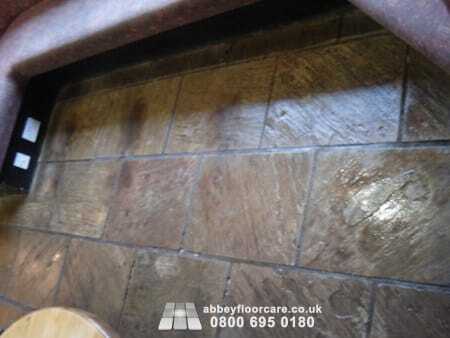 I explained that the problem with steam cleaning was the lack of a detergent to break the soils away from the stone and no way of rinsing the dirty slurry off the floor. 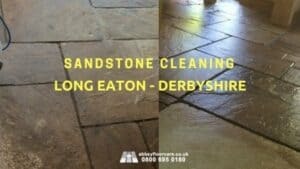 The best way to remove ingrained soil in Sandstone is by using powerful detergents to emulsify the deep-rooted soils and fats, followed by pressurised rinse water to carry away the emulsified soil. 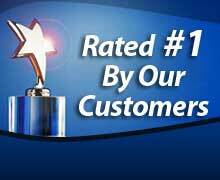 With this information, they decided to hire our sandstone cleaning services to clean the floor. 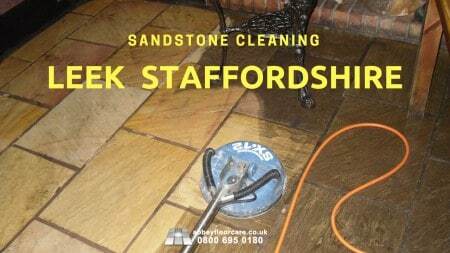 I started the restoration work by applying a Heavy Duty Sandstone Cleaning Solution. The cleaner was left on the floor for around 20 minutes to soak into the surface of the tiles. A rotary scrubbing machine scrubbed the chemical into the stone, lifting the soils away from the pores in the surface of the sandstone tiles. 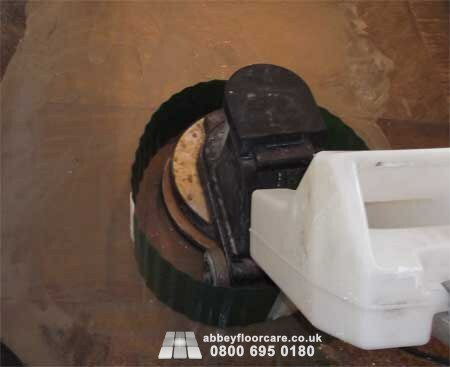 I used pressurised water, rinse and capture equipment to remove the slurry and embedded soils from the stone. 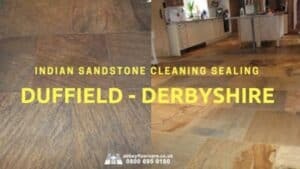 The client was very impressed with the results and commented that they had never been able to get the floor as clean before. 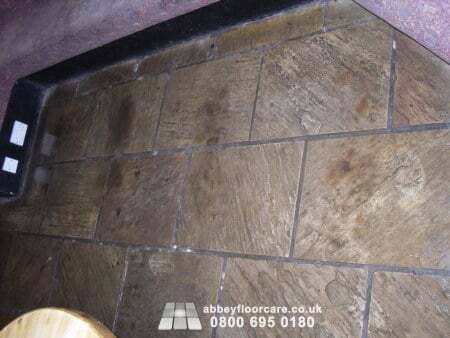 I advise the client of the importance of sandstone sealing to protect the floor from water and oil spills. However, they declined this service.